“As spring sets in early, Israelis have been pouring into one of the country’s most popular leisure spots. Visitors to Canada Park, a few kilometers northwest of Jerusalem, enjoy its spectacular panoramas, woodland paths, mountain-bike trails, caves and idyllic picnic areas. But Eitan Bronstein, director of Zochrot (Remembering), is committed to educating Israelis and foreign visitors about the park’s hidden past — its Palestinian history. “As North Americans, we support the “Global March to Jerusalem” (click here and here) on March 30, 2012. The March is initiated and will be directed by Palestinians from around the world. The Global March to Jerusalem will reassert and affirm the Palestinian refugees’ Right of Return and right of access to Jerusalem. redouble their efforts for emancipation. Arab-owned land in the country’s north to build Jewish-only settlements. 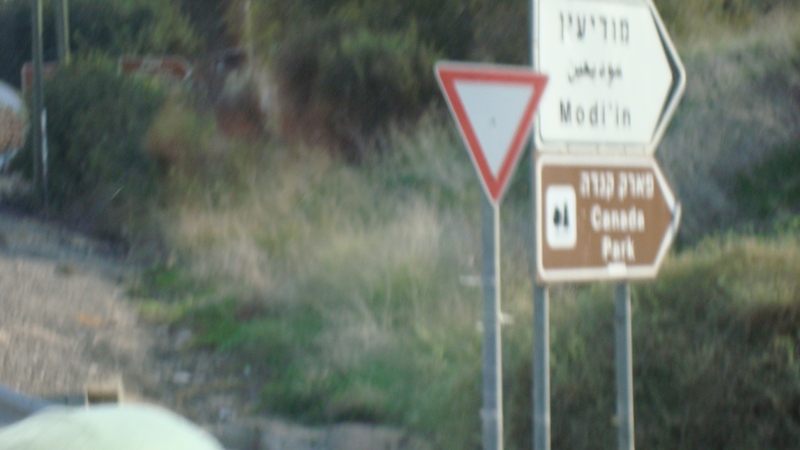 As a Canadian, I am embarrassed that a place (that is part of the story of the expulsion of Palestinians) in the occupied West Bank would be named Canada Park. I am moved to think about Canada’s own colonial history. I choose to listen and learn and join the global movement for justice for all… As one step into this journey, I will be listening to the four-part video at this site – click here. Another step is to learn more about the Truth and Reconciliation Commission of Canada – click here. Plain and simple. Christians are indigenous to Palestine yet they’re leaving due to economic and political instability and the loss of freedom of movement as a result of the Israeli government’s occupation of Palestine. Not due to Palestinian Muslims. Yet, so many news headlines in the past week suggest that Muslims are to blame for so much…and that promotes Islamophobia. See Amira Hass’ article. Also, see today’s article by Karen Armstrong in The Globe and Mail. Jean Zaru is the Presiding Clerk of the Friends Meeting House in Ramallah and a founding member of Sabeel, the ecumenical Palestine Liberation Theology Center in Jerusalem. I highly recommend her book: Zaru, Jean. (2008). Occupied with nonviolence: A Palestinian woman speaks. Foreword by Rosemary Radford Ruether. Minneapolis, MN: Fortress Press. Click here for info. I also invite you to learn more about Palestinian Christians in the recent publication from EAPPI. Click here and then click on the hyperlinked title, “Faith Under Occupation” (the second listing of the title). **See page 46 for the section that I wrote with my EAPPI team-mate. We had the opportunity to ask a number of Palestinian Christians for their perspectives. For interest, why not check out the Charter for Compassion (click here), a civil-society movement facilitated by Karen Armstrong. By visiting the Charter’s website, I found the link to the above-mentioned Globe and Mail article by Karen Armstrong. Plain and simple. We, as Canadians, have an opportunity to live up to our obligations to uphold respect for international human rights and humanitarian law (See Federal Election Kit, 2011, The United Church of Canada, p. 20). Let’s be compassionate…Canada. 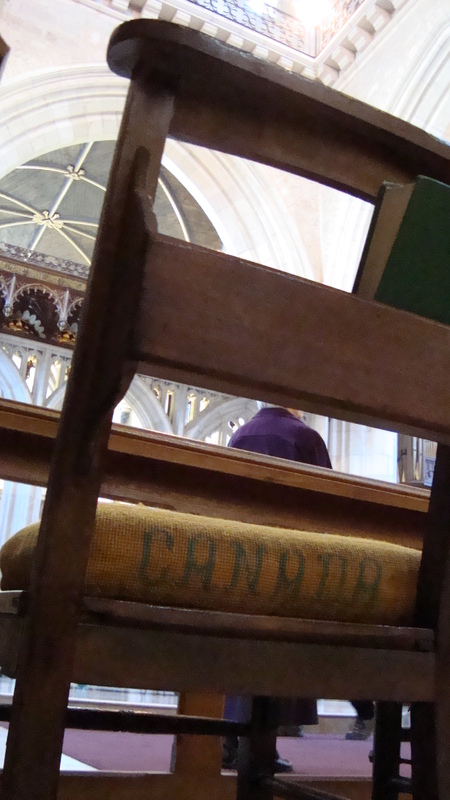 “The Cathedral is home today to two congregations: the indigenous Palestinian Anglicans, often called the ‘Living Stones,’ and a community of expatriate English speaking members. World Water Day – 22 March 2012 – Water is a human right. Here is a June 2011 excerpt from The Council of Canadians’ website: “All governments are now bound by these historic UN resolutions. Whether or not they voted for the two resolutions, every member nation of the UN is now obligated to accept and recognize the human right to water and sanitation and come up with a plan of action based on the obligation to respect, the obligation to protect and the obligation to fulfil these new rights,” says Barlow. Yet, the right to water and sanitation of all peoples in these places is not honoured or protected. I invite you to learn about World Water Day 2012 both in terms of the Canadian, at-home context (click here) and Canadian responsibility in our global community (e.g., in Palestine and Israel – please see below). See the video, “Foul Smell: Treating Gaza’s Wastewater Under Israeli Blockade”. You taught us about reserved areas, permits, and passes…about a century or more ago. Well, maybe not directly. But through visitors fromSouth Africa. You hosted them. And then set up the reserved areas, permits, and pass system here. Apartheid – it’s Afrikaans for “apart-ness”. The friendship between us, now?Canada and ‘Israel’ – BFF: Best Friends Forever!! -ARE you trying? To heal, and reconcile as a society…? Help! Help…we don’t want to bury our pain and forget like you. BFF – Let’s walk together, listen, and listen some more. “As the Israeli army, continues its military attacks, against the Gaza strip, those attacks that started since Friday 10th of march 530 pm, and continue targeting Palestinian resistance armed men, those offensive acts are illegal according to international law, every human is entitled a trial , and assassination act is illegal while resisting occupation is legal according to international law. Gaza Population already lives under a devastating humanitarian situation, while the occupation continues, and the internal conflict is not solved, and the governments of the world are silent. And indifferent. We at the RCSG, appeal to the international community, and to our friends and supporters, spread the word, make the pressure on your governments, to stop these attacks soon. The humanitarian situation in GAZA is on the verge of collapse. The military attacks continue, while we lack electricity and our medical facilities and hospitals have all but exhausted what little fuel we have to operate the alternative generators. We have insufficient medications, 186 basic medications are lacking in our pharmacies and drug stores. Apart from the insufficient medical supplies, children in the special care baby units are in great danger as are renal dialysis patients and cancer patients are dying unnecessarily, unable to have their treatment. Diabetic and asthmatic patients as well as many chronic illness patients, those who need their medications regularly cannot get them. The list is too long to convey in this appeal. Please act immediately to stop this attack against Gaza’s population. You have been always great supporters and showed your solidarity, at the most difficult times. For commentary from a left-leaning Israeli newspaper, click here. For an article from a Palestinian newspaper, click here. We say: Peace… on International Women’s Day. water cannons, flash grenades, and tear gas from Israeli government forces… On 8 March 2012, these items greeted women who walked for peace… Click here to watch the video. These are the women who stand for peace and who live with the ugliness of Qalandiya Checkpoint that prevents free movement between Ramallah, the village of Qalandiya, and East Jerusalem. I remember this ugliness from my time there on early mornings between Dec. 2010 and March 2011. As we enter this new year (from one International Women’s Day to the next), we can draw on the traditional movement song, “We shall not be moved”. 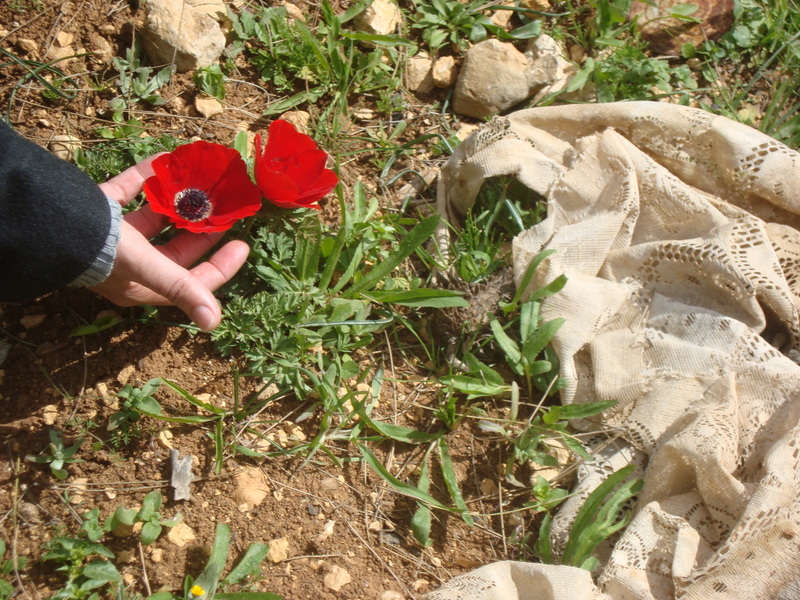 Just like this poppy of resistance that appears in spring in the hills around Jerusalem. And, I’d like to invite us…to be moved. We, we shall be moved…in love…. 1) The REDress Project – “The REDress Project, focuses around the issue of missing or murdered Aboriginal women across Canada. It is an installation art project based on an aesthetic response to this critical national issue.” Click here and here (for Edmonton’s connection).